Wordlinx Review – Scam or Legit? Wordlinx has been online since 0ctober 2003. Wordlinx is owned and operated by a registered company, Rogue Media Ltd.
Wordlinx is a paid to click site in which advertsers pay members to visit their website. 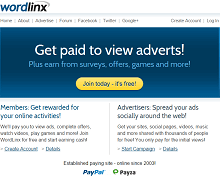 To get traffic, Advertiser pay to Wordlinx for display their ads and when you view those ads you get paid. You can earn money in Wordlinx by viewing ads for some amount of time. You can earn up to $0.001 to $0.01 per ad click. You can get up to more than 10 ads per day. To earn more in Wordlinx, You can refer other peole to the site. There is no limit on direct referrals, So you can get good commisions when you have lots of referrals. You will get 2% of youre referral each click. It is established site paying more than 11 years to their members without any issue. They is no limit on direct referrals. You can make good amount of money if you lknow how to get direct referrals. There is also a 5 level referrals system. The minimum cashout is $10 and it will take time to reach the amount threshold by just clicking ads. So try to make referrals to reach quickly the amount threshold. If you do not want to click ads and want to depend on referrals, then this site is not for you. Because you need to earn $5 from your own click before you request for your first cashout. After first cashout, you need to earn $0.50 from your own click to request cashout. There is a Wordlinx reward features in which you find the offers and survey. Most of the times,You will not get rewarded for your hard work so it is better to focus on making direct referrals. If you want you can, its up to you. Wordlinx is a legit PTC site which is paying on time to their members. It is very slow to earn in Wordlinx, If you not have good amount of referrals. If you have any questions or comments Please do leave them below. We would love to hear your feedback.